MELBOURNE, Fla., October 9, 2018 — Brevard Zoo is working diligently with Florida Fish and Wildlife Commission (FWC) to provide a permanent home for bears who cannot remain in their natural habitat due to unfortunate circumstances. 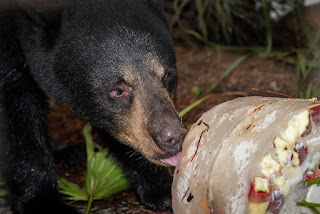 A 20-month-old, as-yet-unnamed Florida black bear arrived in August and will make her appearance to guests in early 2019. The bear has already formed bonds with keepers, who have been providing her with daily interactive enrichments. They report that she is very smart, curious and attentive. The Zoo’s veterinary and animal care staff conducted an overall wellness check and found her to be in good health. The bear was brought to the Zoo after FWC responded to a report of a Tallahassee-area woman feeding dog food and water to a bear. Because the animal was accustomed to receiving food from this woman, she did not know how to take care of herself without interacting with humans; this could have resulted in a tragic incident if the bear remained in her natural habitat. Had she not found a permanent home under professional care, the bear would have been euthanized. As part of the Give from the Heart appeal at the Zoo’s annual Safari Under the Stars fundraiser in April, attendees and additional donors contributed more than $200,000 to the project, with the largest gifts coming from the Cover Family Fund, Walter Gatti, Suzi Goodell, Tom and Courtney Hermansen, John and Merete Hermansen, Vince Lamb, Martha Kehoe, Michael and Mary Louise Coleman, Thomas Simon and Naomi Ware, and Bonnie and Jack Mollen. Those wishing to contribute to this project should contact individual giving manager Tracy Steele at tsteele@brevardzoo.org or 321-254-9453, ext. 234.